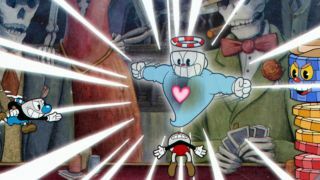 One man vs. Cuphead's flower power. In Now Playing articles PC Gamer writers talk about the game currently dominating their spare time. Today Phil tries to get good. Up until now I have been avoiding Cuphead. It’s hard, and that makes it dangerous. If you have been on the internet at all, you’ll know that it is not acceptable to be bad at difficult videogames. Die recklessly in Dota, and you will be chased out of your home. Mistime your ult in Overwatch, and you will be excommunicated by the head of the church. We must hide the sin of mediocrity behind a facade of stoic capability. Case in point: a games journalist posted a video of himself being bad at Cuphead’s tutorial, and it generated a 2,666 comment Reddit thread and multiple op-eds asking if people who write about games are allowed to be bad at them. This isn’t a joke, except in the existential sense. The writer apologised for his crime, and now probably lies screaming as imaginary crows peck at him from a prison of his own mind. Or something. Naturally, as the editor of PC Gamer magazine, it is vital that people think I am good at videogames. No doubt our parent company would launch an official inquiry if they ever discovered that I’m playing through Divinity: Original Sin II on its easiest mode. It would, of course, be easier to not play and write about Cuphead. But it looks stylish and fun, and more importantly I’m already three paragraphs deep into this write-up. There’s no backing out now. I head into the tutorial. It’s fine. Maybe this won’t be so bad? I head into a level—a boss fight against a blue slime. He jumps in predictable patterns. (So far so good.) Then he grows an arm and punches me in the face. (Less good.) Then he grows to double his size and murders me. (Actively bad.) I die repeatedly as I learn to avoid his many tricks, but each time I’m getting closer. Eventually it happens: he dies. I win! I get a ‘B’ rating, denoting my basic competence. Over the next couple of hours, I make my way through multiple bosses. I even beat the field full of angry vegetables on my first attempt—albeit largely because I’d already attempted that level numerous times at a press event. I am getting Bs all over the place. My adequacy is supreme. And then I meet the flower. It throws seeds, which grow into small enemies that jump from the bottom of the level, or fly through the air like heat-seeking missiles. It throws projectiles and extends its head out across the screen. I can’t make any headway—learning attack patterns isn’t easy when those attacks come from every direction. Eventually I admit defeat, ending my streak by quitting the game. I have failed, and that’s fine. Is Cuphead difficult? Sure. But there’s no punishment for dying. It’s streamlined and effortless—you try again and again, slowly making progress until you win. The sad thing about the online obsession with being good is it inevitably misses the point. You’re meant to bad at Cuphead. And then you play it and get better. Or get annoyed at a flower and quit.